We have plenty of pesky critters in Albuquerque. Keep them away from your pet. In Albuquerque, we are fortunate to have excellent weather and ample opportunities to enjoy the outdoors with our pets. Although our parasite density is not as high as it is in more humid and temperate climates, we do see a variety of internal and external parasites within the city of Albuquerque. Of particular importance is the rising incidence of heartworm disease: Albuquerque now has more cases of heartworm than anywhere else in the Southwest. Fleas, ticks and gastrointestinal parasites are seen sporadically throughout Albuquerque, and your pet’s likelihood of encountering them depends on your location within the city and your pet’s recreational activity. Pets who travel have higher risks of parasitic infestations, so keep that in mind while preparing for vacation with your pets. In general, puppies and kittens are more prone to infestation and tend to be more severely affected by parasites. At Aztec Animal Clinic, we evaluate risk and determine the most appropriate diagnostics and preventatives for parasite management. This is an important part of the pet wellness care provided at Aztec Animal Clinic. Read on for more information about external and internal parasites commonly found around Albuquerque. Heartworm-carrying mosquitoes represent a lethal danger to your pet. A mosquito’s bite can transmit heartworm larva to your pet, and the larva then slowly develops and moves toward the heart. Once there, it matures and grows within your pet’s pulmonary artery, leading to constricted blood flow, heart disease and major organ failure. All canine patients, no matter where they live, should receive heartworm preventative medication regularly and should be tested annually by their veterinarians. This is particularly important for dogs living in Albuquerque, where heartworm levels are higher than anywhere else in the Southwest. Ticks are found lurking in shrubs and tall grass, and they bite pets and feed on their blood. Although ticks are nearly microscopic, they are serious dangers to your pet’s health. A single tick bite can transmit numerous potentially fatal diseases including Lyme disease, typhus, Rocky Mountain spotted fever, ehrlichiosis and anaplasmosis. Although it is rare, animal-to-human tick transfer is possible, so any tick on your pet is also a hazard to you and your entire family. Inspect your pet and yourself carefully after any woodland activities to make sure you don’t bring any ticks into your home. These bloodsucking insects feed on mammals and lay eggs in their fur. 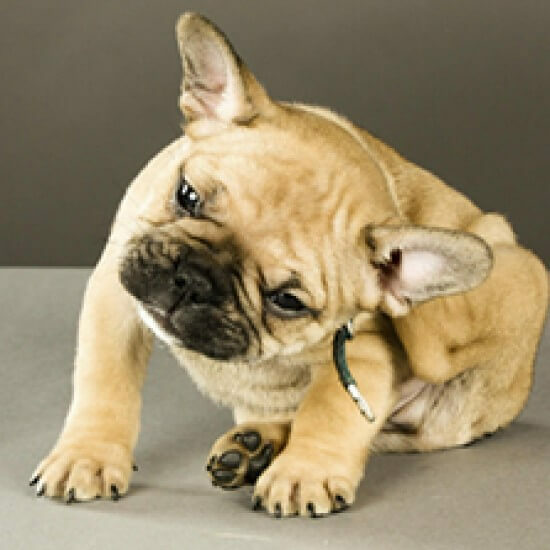 Fleas can transmit harmful parasites like tapeworms and Murine typhus, and they can cause dermatitis and anemia. 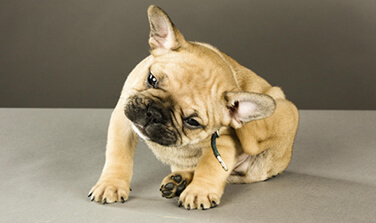 One flea can reproduce nearly 50 times a day, so a flea infestation is a substantial threat to your pet’s well-being. Because fleas reproduce so quickly, flea infestations often spread throughout your home, burrowing into your carpet and furniture, which makes them tough to eradicate. Keeping chicken in the backyard has lead to more dogs and cats becoming infested with sticktight fleas. These fleas tend to prefer the face and ears and can be particularly difficult to remove. Giardia, roundworms, hookworms, whipworms, tapeworms and coccidia are some of the internal, gastrointestinal parasites that commonly infest small animals like our pets. Depending on the age and general health of the infested pet, the effects of these infestations can range from mild to life threatening. Some gastrointestinal parasites are zoonotic, which means they pose risks to human health as well, as they can be passed from animals to humans. Your pet’s Aztec Animal Clinic veterinarian will consider where you live in Albuquerque, where you and your pet spend your free time, your pet’s travel history and your pet’s age to create the best parasite prevention plan for your specific pet. Regularly applying antiparasitic medication is the only surefire way to keep your pet free of the nasty external parasites that wreak havoc in and around Albuquerque. Consult your pet’s Aztec Animal Clinic veterinarian to determine the best parasite control products for your pet. Schedule an appointment at Aztec Animal Clinic immediately if you suspect that your cat or dog may already be infected.